Heat exchanger defects are usually caused by poor maintenance or operational issues. When defect occur, they tend to crop up in the same areas on any given make or model of equipment. This manual will broaden your understanding of how defects occur in furnace heat exchangers and will enable you to accurately assess the integrity of any furnace. 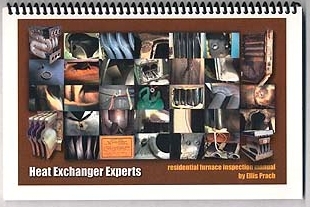 You will be led through the steps to identify defects, according to the history of metal failure in a variety of commonly used residential furnaces, and taught the techniques required to conduct furnace heat exchanger evaluations. The Heat Exchanger Experts Manual will prove to be invaluable for seasoned technicians, novice technicians and everyone in between. It is designed to fit in your toolbox or glove compartment of your vehicle. Q: is this book for 90% and 95% high efficiency? A: There are examples of 90% and 95% efficient furnaces in this manual. 160 TruReward$ points will be placed in your account when you buy this item.